Bicycle! Bicycle! 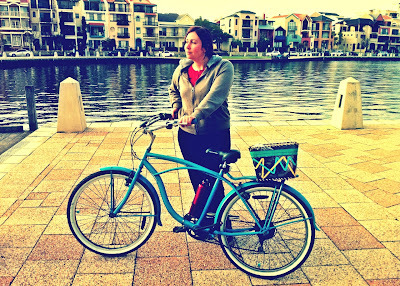 : Friends With Bikes. 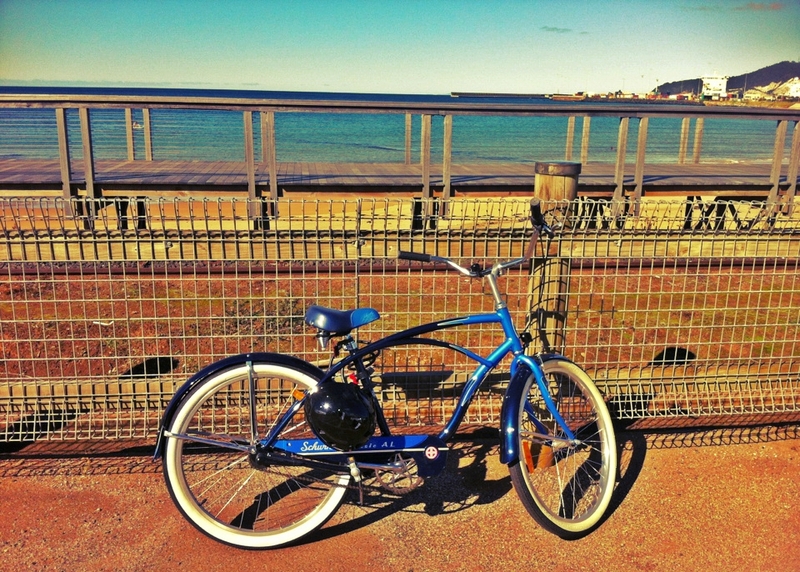 Schwinn Jenny 7 Speed 2011 model. Pashley Princess Sovereign in Buckingham Black. When bicycle shopping, my physical requirements are not too difficult to satisfy. 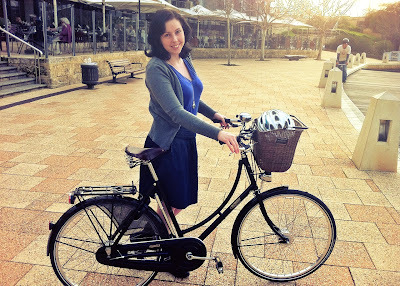 I prefer to stay on the saddle and toe-touch stabilise the slightly tilted bicycle when at a stop rather than hopping off and standing astride as some people do. I am injury free from the middle down (some neck and shoulder problems) with reasonable strength in my legs thanks to life as a pedestrian. I am 175cm (5ft 9inches) tall, which is either average height or tall depending upon where you live. 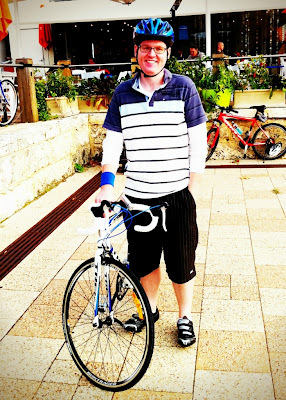 In Western Australia particularly, I am firmly average so it was very easy for me to find bicycle frames in my size. 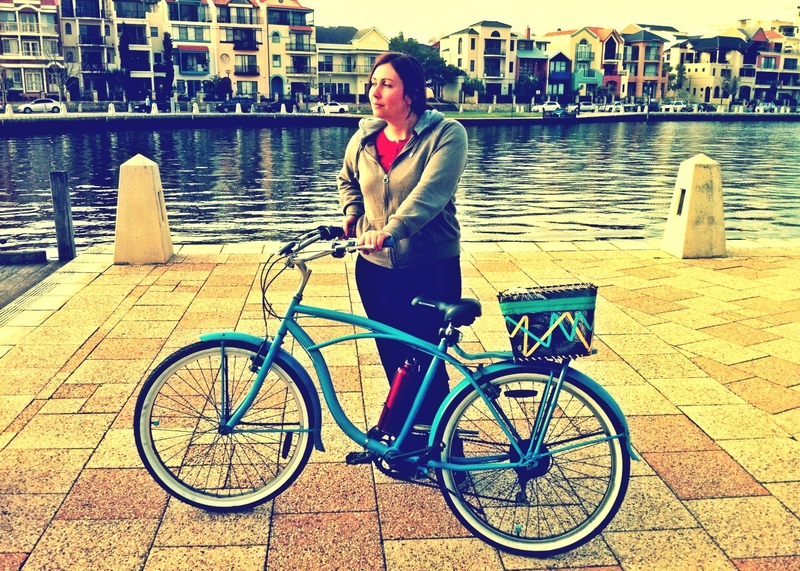 The Pashley is a medium 20" frame which was also the only available size in Perth. Being on the line between average and tall, I could also fit a 22.5" Pashley frame if it was offered. Some people prefer their bicycles to feel large, Dutch bikes are very good at this but the Pashley strikes me as being designed more compactly and I don't really have a preference in relative scale. Distance between seat and bars matters less in an upright bicycle as you're not stretching your torso forward to the handlebars so I'm happy with the medium. The seat post adjusts to fit my leg length and the bars also raise accordingly so the overall feel of the 20" Pashley for me is 'neatly tailored' rather than tight. The Schwinn Jenny is a size S(Small) frame and was also the only size available in that particular shop. However, many Schwinn dealers in Australia offer bikes from XS to L so if your requirements are more specific, be sure to check bikeexchange. A sticker affixed to the seat post declared me at the very upper limit of suitability for the small size (It read 'Up to 175cm'.). Again, the seat is high enough so I don't feel cramped. It also has a handy quick adjustment lever which makes it great for lending to bikeless friends of most heights when on social jaunts. The handlebars stay at my preferred height as they require a spanner. a popular non-lycra clad rider bicycle destination. 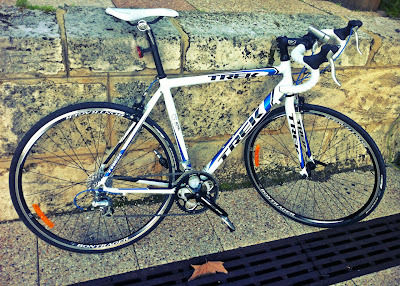 'Trek 1.2' 2011 model, 18 Speed Aluminium frame Men's Road Bike. Schwinn Classic Al 3 Speed 2009 model aluminium cruiser. At 186cm tall (6ft and a smidgeon), Ginger is on par with the average Australian man of Gen-Y and a majority in the generations above and below (Each new generation tending to be taller than the last). His Trek 1.2 2011 road bike is a size 56cm/Large men's specific frame. As men have longer torsos compared to leg length, your average lightweight, modern road bike frame is scaled accordingly between seat and handlebars. Traditional style steel flat bar road bikes tend to be unisex with the smaller sized frames being suitable for most women. Ginger's Schwinn cruiser is officially a men's frame but has a one size fits most construction thanks to the crank forward (aka 'flat foot') positioning of the pedal to seat post relationship. This means that at rest your feet are both firmly touching the ground, making it excellent for nervous cyclists and yet another flexible bike for lending to friends of different heights. 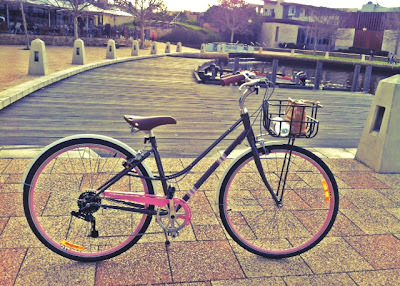 Australian Giant 'Via 2W', 8 Speed 2012 model, XS frame. swooping, mixte inspired split top tube. American models differ in features and colours. Boo and Bike, a match made in very short heaven. At a diminutive 149cm (4ft 11") tall, our friend Boo had some difficulty finding a bicycle frame in Perth as not many retailers in Australia offer truly smaller sized frames. (Just look at how big my small Schwinn is!) 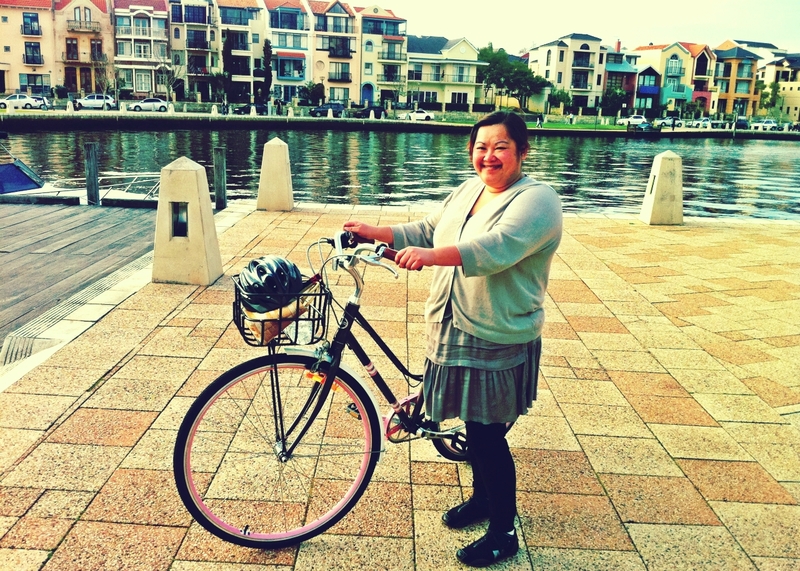 Initially she purchased a size S Giant 'Via W' 8 Speed 2011 model in black but even with the seat down as far as it would go, her toe was nowhere near the ground and Boo keenly felt the lack of stability when stopping. There was a half-joking investigation into children's bicycles until it was realised that Giant Australia do actually offer frames in an XS size. Sadly, the 2011 was not available in an extra small as the models were transitioning into 2012 editions (New models of common bike brands arrive mid-year) but fortunately, the shop of purchase was willing to exchange her small 2011 Via for a 2012 in an XS. Rather than black with silver floral flourishes, the 2012 Via 8 Speed was a quirky chocolate with pops of pink and hints of white, giving the whole affair a distinctly 'Rocky Road' vibe. It makes me happy when I see it because it reminds me of marshmallows at a fondue party. Giant Vias also come in 3 or single speed depending upon country of sale. If you are petite, Giant is worth investigating as their XS is in fact EXTRA small. Perhaps a centimetre difference in height compared to me but definitely the same shoe size, The Hippie is also fortunate enough to be average in her bicycle requirements. 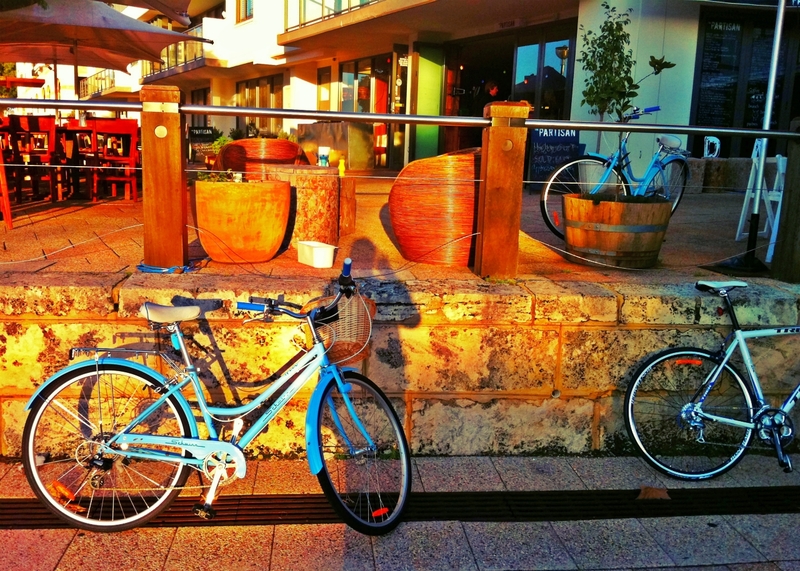 Her cruiser was purchased from ebay; second-hand and already resprayed. Consequently nobody knows the make or model but I can tell you that it is incredibly heavy so it must be made of steel and also be the oldest of these bikes. As you can see, the frame shape is the same as Ginger's cruiser. Technically I suppose it's a men's frame but the cruiser style reads as unisex so nobody throws rotten fruit at her in the street for defying gender expectations. 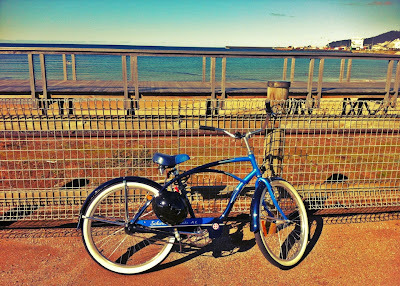 Like all cruisers, The Hippie's bike has a 'flat foot' position when at rest so fit is flexible and determined by comfort rather than measurements. Together, the cruiser and The Hippie work in laid-back harmony. Despite differences in bike type, dress and riding style within my own circle of friends, all of our bicycles are compatible because the riders are compatible, willing to stick with each other on social rides no matter how relaxed the pace. Regardless of personality, height, leg length or comfort level there is a bike to satisfy all of us. Do the research, try as many as you can, add some pleasant people and you can't go wrong either.